Location: Novotel London West, Hammersmith, London, UK. Yes, that's right. It's called Preview 2007 despite taking place very firmly in 2006 because it showcases products expected to make it big in 2007. This is, in effect, the precursor to the bigger ATEI trade show that takes place a couple of miles East at Earl's Court. 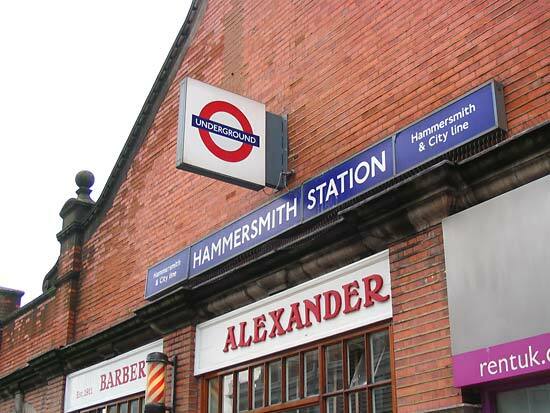 But Preview 2007 takes place in Hammersmith, a few minutes' walk from the tube stations. The UK has just had revisions to the slot machine stake and prize levels, so there were lots of AWP (amusement with prizes) machines around, mixing with the video games, kiddie rides and pushers. But there was pinball there too, in three different flavours. 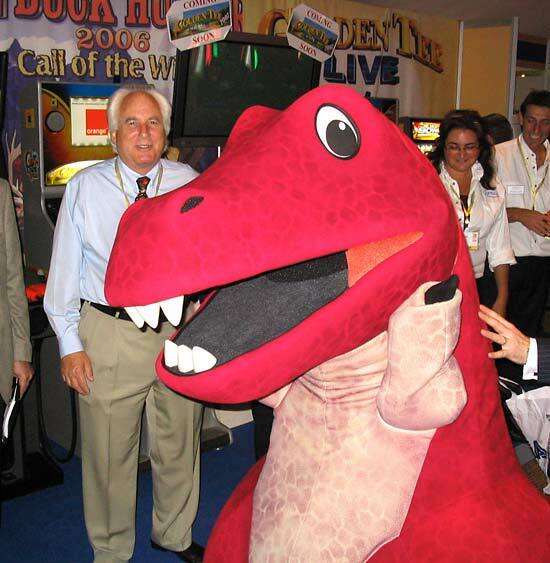 First, Gary Stern was there for just one day to promote Stern Pinball Inc's products - in this case the Pirates Of The Caribbean pinball game and The Simpsons Kooky Carnival redemption game (in this pre-production sample it was called The Simpson Crazy Carnival instead). 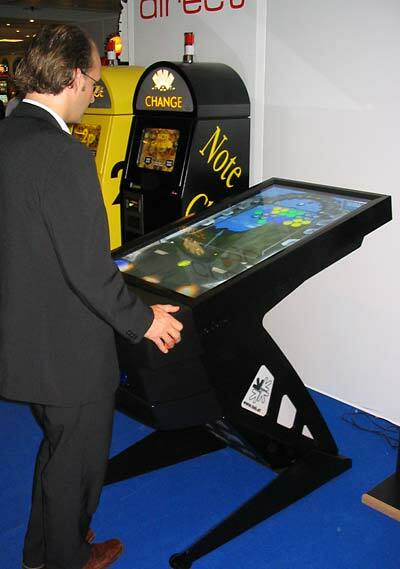 They were joined by a World Poker Tour to show both games using the new SAM hardware system. 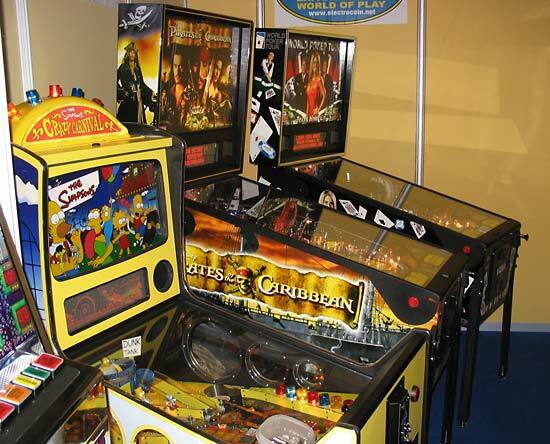 I think the Pirates Of The Caribbean was the same machine used for the Pinball News In-Depth Review as it exhibited the same failed switch on the Broadside ramp. 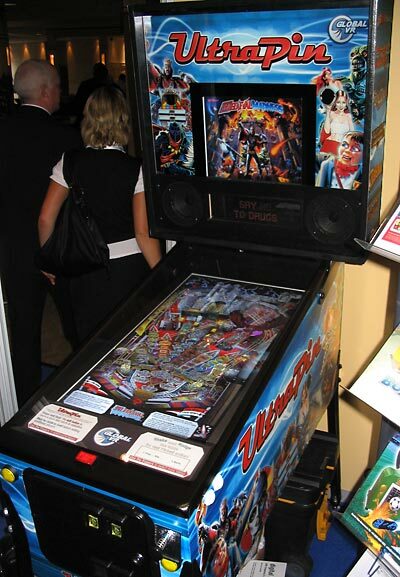 Gary Stern was keen to point out how the new pinball machines and themes brought a whole new generation of players to the game. The Stern games were on the Electrocoin stand in the Champagne Suite. Just around the corner on the Crown Direct stand was a lone TAB Virtual Pinball machine which appeared to have a number of new tables and games installed but there was no documentation or signage available to confirm this. 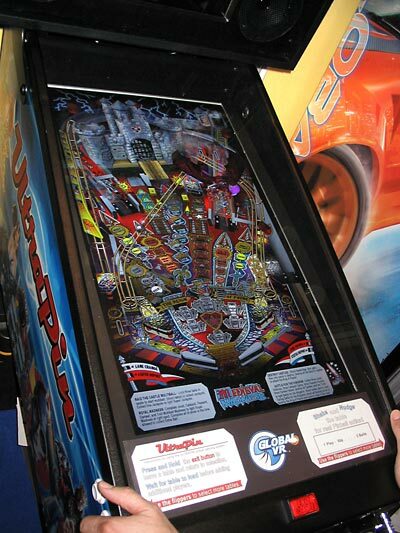 The third pinball presence was from Global VR who were showing a pre-production version of their UltraPin game on the Cosmic Video stand. 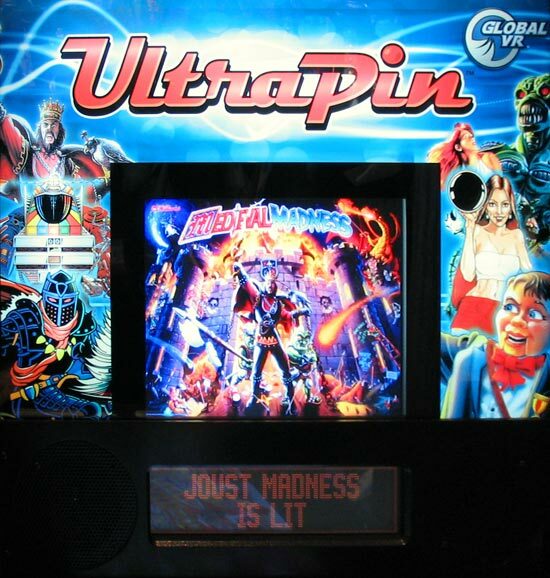 UltraPin is a PC-based emulation of Williams/Bally games using a plasma screen in the cabinet to display the table, and an LCD display in the backbox to show the backglass and the score display. Although the backglass image is nice and bright, the dot matrix part of the display looked rather dim in comparison. The game includes a real plunger and is tilt/nudge sensitive which seemed to work very nicely. The game arrived in the country on Friday from the US and is just about identical to the production version which should be available to buy before Christmas this year. The price is £3995 which includes 5 tables - Medieval Madness, F14 Tomcat, Strikes & Spares, Xenon, and Sorcerer. Further tables can be bought in a gamepack of 6 games costing £495. The aspect ratio of the main screen doesn't quite match a real pinball game so the overall impression is of a slightly squashed image. This is probably because GlobalVR have chosen to include the bottom arch and instruction cards on the display rather than use that area for the playfield, giving - in effect - two bottom arches. There is a big red button on the lockdown bar to enter game choice mode, and you then use the flipper buttons to choose a table to play. There are two sets of flipper buttons although only the usual ones work at present. The others are for future games that require them for magna-save, ramp diverters (Shadow) and similar features. The UltraPin is about the size of a Safe Cracker machine. It's 28 inches (71cm) wide, 74 inches (188cm) high, 50 inches (127cm) deep.and weighs 250 pounds (110Kg). Preview 2007 was well attended but because it's much smaller, it's a less frantic event than ATEI. You can actually stop and talk to the salespeople and fellow visitors without fear of not seeing everything if you stop moving. It was good to see Gary Stern there and to see how soon the UltraPin will be released. I know a lot of operators are looking forward to this product in particular. Hopefully it can be used to add video pinball to locations that would not otherwise consider a real mechanical pinball game, and not as a substitute for existing locations.